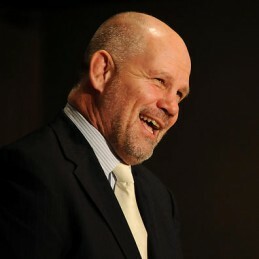 Peter Fitzsimons is a former rugby star, best-selling author, television presenter on Fox Sports, and highly respected contributor to the Sun-Herald and Sydney Morning Herald. Peter has co-hosted radio programs with Mike Carlton and Doug Mulray and interviewed celebrities from George Bush to Diego Maradona. Peter has written twenty best-selling books, including: Batavia, Tobruk, Kokoda, A Simpler Time, and Little Theories of Life. In 2001 and 2004 he was Australia’s best-selling non-fiction author. Peter has written biographies on Douglas Mawson, Nancy Wake, Nene King, Les Darcy, Steve Waugh, Nick Farr-Jones, Kim Beazley, John Eales and Charles Kingsford Smith. Born on a farm in Peat’s Ridge, Peter went to school at Knox Grammar School then accepted a one-year American Field Service Scholarship in Ohio. When he returned he completed an Arts degree at Sydney University, majoring in government and political science. Peter made his Wallabies debut under Coach Alan Jones. He would play rugby in France and Italy for five years, learning French, Italian and Spanish languages. Peter joined the Sydney Morning Herald full time in 1989 and has since been labeled ‘Australia’s finest sports journalist’ by Andrew Denton. Perhaps the premier interviewer in the Australian media, Peter’s credits include George Bush, Sir Edmund Hillary, Jodie Foster, Nicki Lauda, Joe Montana and Carl Lewis. From Shane Gould to Allan Border, he has interviewed almost every major Australian sporting figure and every Australian Prime Minister from Gough Whitlam to Julia Gillard. Peter is a highly sought after after-dinner speaker who will engage and captivate sporting and non-sporting audiences alike.